Aberdeen manager Derek McInnes claims there is no need to panic despite his side’s Betfred Cup final hangover. Since being defeated 3-0 by Celtic at Hampden last month, the Dons have lost ground on second-placed Rangers after taking only four points from a possible 12 in the Scottish Premiership. After Saturday’s 2-1 loss at Ross County, McInnes’ men will try to bounce back with a victory at Motherwell tomorrow night that would move them to within four points of Mark Warburton’s side. 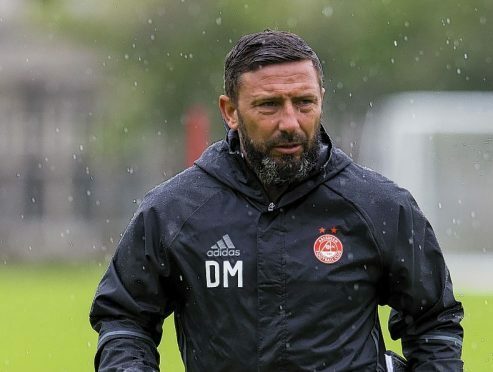 But with Aberdeen only halfway through their league fixtures, McInnes is confident his players can get back on track sooner rather than later as they bid for a third consecutive top two finish. McInnes said: “It is important that everybody keeps calm and trusts our experience, I am sure we can get the results we want. “I think there has been a hangover from the supporters after the final and potentially from ourselves. “We have told the players we can’t allow that. Whether we had won or lost the final, it was important to fully concentrate on the next part of the season and get some league wins. “I believe we have had some decent performances since the cup final, including the performances at Ibrox against Rangers and at Ross County on Saturday. We had a very strong performance in the 5-1 win against Kilmarnock at home but we huffed and puffed in the 0-0 draw with St Johnstone. “We didn’t do enough to win that game, but in the couple of matches we lost the performances weren’t far away from what we expected. “It is important the players remain confident. We have a good set of lads here and we have never thought we were this or that. Tomorrow’s match will be the second time the Dons have lined up against Motherwell in the space of 10 days after last week’s game at Pittodrie was abandoned after seven minutes due to floodlight failure. McInnes added: “Even though this match is away from home, it is the same opponent and we know we will need to work hard to get a result. “Motherwell tend to play with a front three and normally score goals so we need to make sure we limit their opportunities.